My last cooking adventure somehow reminded me at my childhood. And I still don’t know why! I think the taste of that yummy dish is similar to something my mother made me for dinner as a child. I´ll have to ask her an figure it out! 😉 But maybe you´ll feel the same way when you eat that Ukrainian dish. It has all you like when you are a child. It´s sweet, fruity soft and filling. They call it Varenyky – варéники. And indeed my Ukrainian teacher Eva told me that she ate those dumplings as a child. You also can ate them hearty but we decided to make a sweet and easy cherry filling. Eva is vegetarian and so are the Varenyky but it was pretty easy for us to make them vegan. Mix flour, baking powder, sugar and salt. Add enough water to make a medium-soft dough. Knead by hand until smooth. Let rest for 30 minutes. Roll out dough on a floured surface. Using a glass or sth. else that´s round cut out dough rounds. With a knife or a tablespoon carefully butter the rounds with soft vegan butter. Sprinkle some cinnamon on each round. Take two or three sugared cherries – depending on how big your rounds are – and place them in the middle of each round. Fold the dough over to form a half-circle and press the edges together until well sealed and there is no air trapped in the dumpling. Bring a big pot salted water to a boil. Carefully put the Varenyky into the water. Not too many at a time or they will stick together. Cook for about 8 minutes. 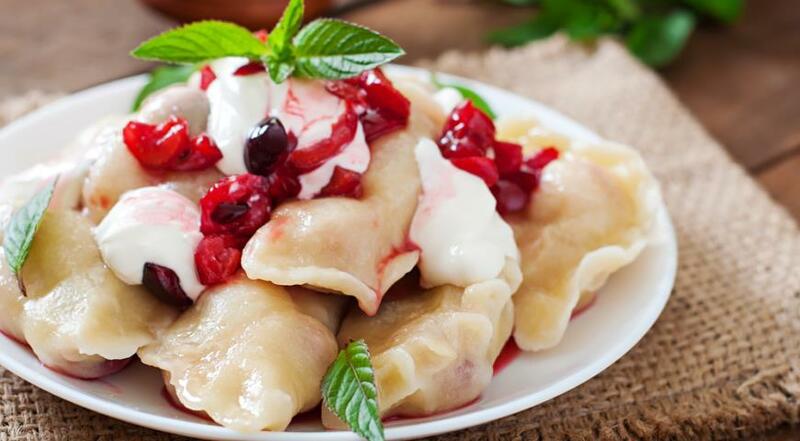 Serve with fresh fruit and/or sprinkle some sugar over the Varenyky.